While our vet recommended the typical bland diet of rice and cooked chicken, we didn’t see much improvement until adding Dr. Harvey’s Runs Be Done nutritional supplement into the mix. This combo got us through the worst of things (and got his poops back to normal), but he still wasn’t acting quite like himself. Canine Health is a dog food pre-mix, that allows you to easily make homemade meals in minutes. Despite being Dr. Harvey’s most well known formula, we had actually yet to try it in the MyDogLikes household until now. 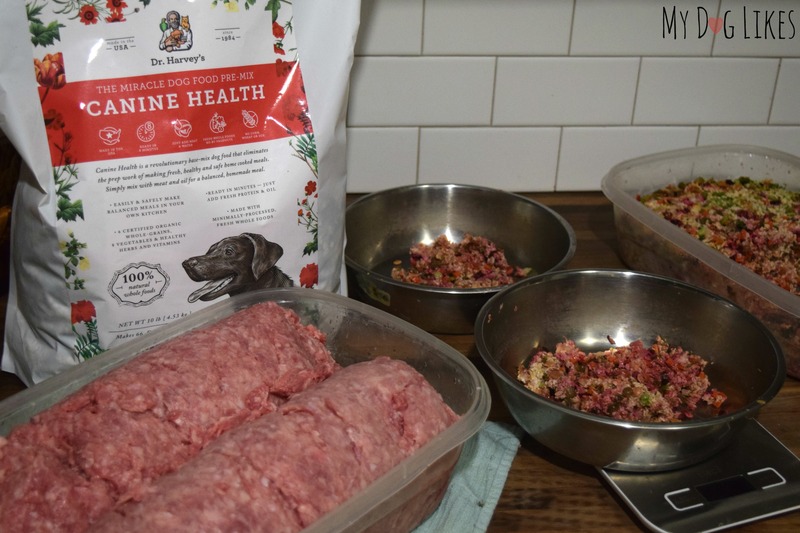 Like everything from Dr. Harvey’s, Canine Health consists of only real, fresh, human-grade food. Inside you will find 6 organic grains, 9 vegetables, and no artificial ingredients, preservatives, dyes or chemicals. A quick look at the top 15 ingredients will tell you just about everything that you need to know about this food! For years we tried to steer clear from grains in our dogs food due to what we thought was a grain allergy. 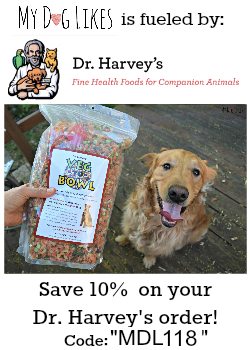 Through Dr. Harvey’s, we learned that their issues may have actually been due to common additives and preservatives found in kibble instead. Sure enough, since switching to a Dr. Harvey’s based whole food diet, our boys have seen tremendous improvements in allergy symptoms – even while experimenting with grains! So, when Dr. Harvey’s said that Canine health had been shown to help to bind loose stools, we weren’t concerned about the grains in the slightest! Canine Health comes in a dehydrated form, so you will need to re-hydrate before using. 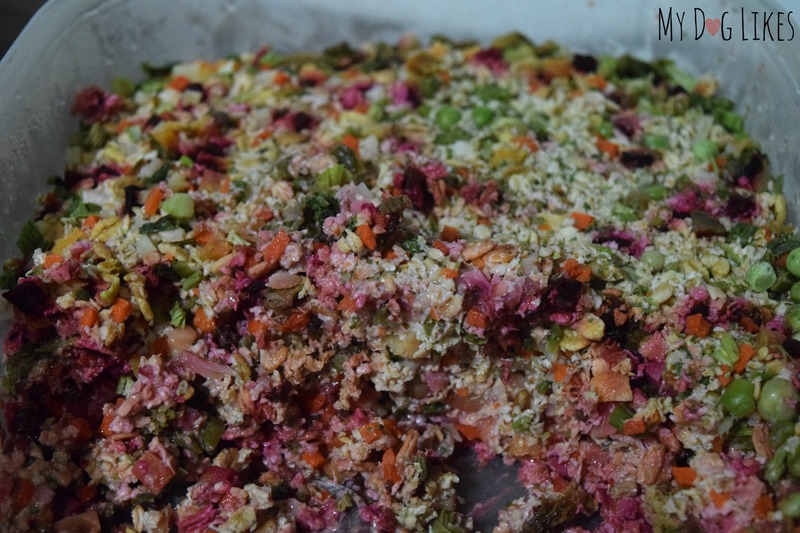 Simply add warm water in a roughly 1-1 ratio, wait 8 minutes and it is ready to go! Although it only takes a few minutes, we like to prepare several days worth at a time in a large container and store in the refrigerator. This makes meal time as simple as scoop and serve! Though we have been moving toward a raw meat diet, we figured we should play it safe and use browned turkey until we were confident that Charlie was feeling better. For a healthy fat, we added our favorite dog fish oil supplement from Dr. Harvey’s. 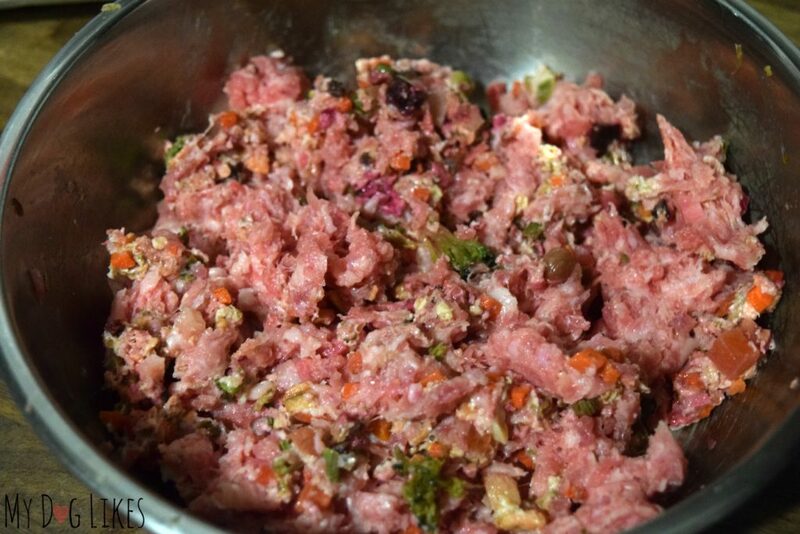 Not only was Canine Health extremely easy to prepare, but when it is ready smells like a homemade meal! Even we were drooling! 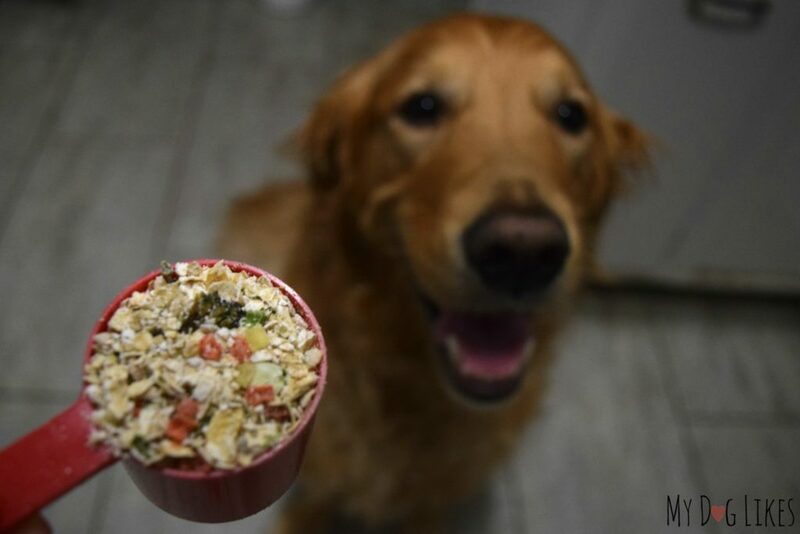 We also loved that you can pick out individual ingredients right in the mix, so there is no doubt when you are serving that this is REAL FOOD – Something which is so refreshing in the pet industry! Within a few days of transitioning to Canine Health, Charlie had more energy and was running around like his usual self again. This naturally balanced formula has shown to be gentle on dogs digestive tracts, and this was exactly what we saw in our boys. And we are not alone! Just head on over to their website for tons of testimonials where dog owners at their wits finally found an answer with Canine Health! We loved Canine Health so much that we have continued feeding it to this day, roughly 2 months later. After a couple of weeks we began serving with raw meat from a local co-op and the pups continued to thrive. Not only have their stools remained firm, but they are significantly smaller as well. Anyone who has to pick up after 2 large dogs will see the benefit in this! Canine Health proved to be the missing piece in getting Charlie back to normal, and running around like a pup again. 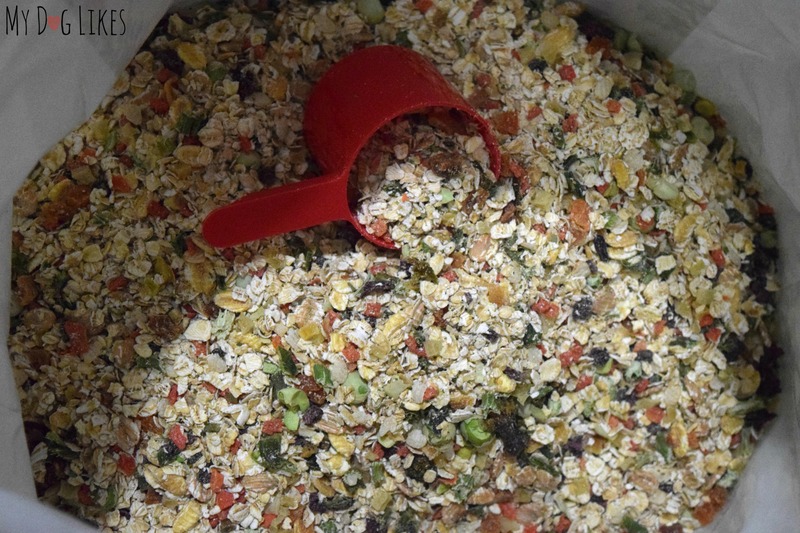 Just like all of the Dr. Harvey’s pre-mixes, it is super easy to prepare, and we love that is is especially gentile on their stomachs. 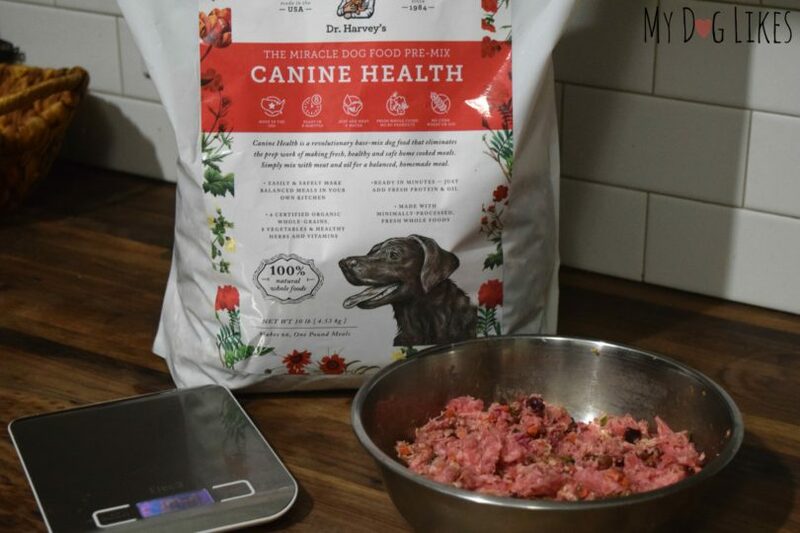 For those looking to experiment with a raw or homemade diet, Canine Health is a huge time saver as well. Imagine trying to source, clean and chop 9 different vegetables on a regular basis! Save yourself the headache with an already balanced formula as the base! 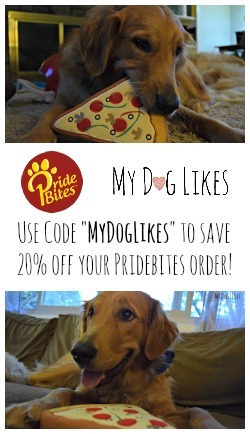 Want to try out Canine Health for yourself? Dr. Harvey’s is currently offering a free sample to anyone interested! Just visit the link below and enter your information at the bottom of the page. We’re glad he is back to his old self. He is too young to not be feeling well. The food look delicious! We’re glad, too, that Charlie is feeling more like himself again! We don’t do raw meat in this house. But Shadow’s been taking Treatibles’ CBD Oil Gel Caps for just about a month now and they’ve been doing wonders for her.